Length: Isaiah 24 is 23 verses long. Date: No date of composition is given. However, Gary Smith and Holman's OT Commentary on Isaiah date its writing between 701 BC and 695 BC - based on certain passages compared to historical events. Structure: At one point scholars categorized ch. 24 as part of the apocalyptic genre of ancient Israel literature. However, as Smith points out chapter 24 is now considered more eschatological in nature than apocalyptic. The difference, over simplifying the matter, is eschatology views God as working within the history of mankind, whereas apocalyptic literature tends to lean towards complete corruptness and sin within mankind, thus the need for God's judgement and destruction of the current order. By definition eschatology means; the final future events of earth dealing with death, judgement, redemption and the final state of earth and mankind according to God's plan. Click to view the particular verse. "Then God spoke to Noah and his sons with him saying; 'Now, behold, I Myself do establish My covenant with you, and with your descendants after you...and all flesh shall never again be cutoff by the water of the flood, neither shall there again be a flood to destroy the earth.'" Chapters 13-23 have dealt extensively with the nations of the earth and their judgement by God. Isaiah 24 is the culmination of these events, for as each nation on earth receives God's judgement, so now does the earth itself stand trial before YHWH. This chapter has been called Isaiah's Apocalypse, or The Little Apocalypse of Isaiah and deals with the earth in the future day of the Lord. Decades earlier to the time of writing of Isaiah 24 the northern kingdom of Israel had fallen to the mighty Assyrian Empire. 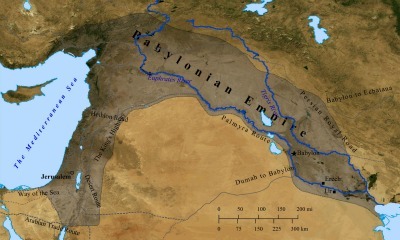 Assyria destroyed the Northern Kingdom and exiled its inhabitants throughout the Assyrian Empire. Now, Judah stood alone in the south (with Benjamin) as the lone surviving tribes in Israel - with Jerusalem as its capital city. Gary V. Smith argues Isaiah wrote Isaiah 24 ca. 701 BC, when the Assyrian army laid waste to most cities in Judah, and encircled the city of Jerusalem in an attempt to destroy and subjugate the remaining Israelites in the land. This indeed was a day of great distress for Isaiah and his audience. Isaiah urged King Hezekiah and the people to trust God now and future deliverance would be certain. 1 Behold, the Lord lays the earth waste, devastates it, distorts its surface, and scatters its inhabitants. The phrase, "distorts its surface", is an interesting phrase. The NIV reads, "He will ruin its face." The King James uses the phrase, "turneth it upside down". The LXX reads; "...and will lay bare the surface of it". The Hebrew word used and translated in the NASB as "distorts" is Avah. Avah is used 17 times in the OT (Zodhiates) and is variously translated as: to crook, to be bent, to writhe, to act perversley, to turn upside down. The essential meaning is to deviate from the proper path. The natural question is: What is happening on the earth's surface that is so devastating in Isaiah 24:1? What does this phrase, "distorts its surface" (and various translations), mean? Other verses in Scripture with similar language and imagery will shed light on what is happening. "And men will go into caves of the rocks...before the splendor of His majesty when He arises to make the earth tremble." "Therefore I shall make the heavens tremble, and the earth will be shaken from its place at the fury of the Lord of hosts in the day of His burning anger." "The earth is broken asunder, the earth is split through, the earth is shaken violently." There can be little doubt Isaiah is referencing intense seismic activity within the earth. Primary causes of which are earthquakes and volcanoes. It cannot be denied that in the last ten years earthquake activity has increased significantly worldwide. Studies over the last 5 years state earthquakes are indeed increasing in frequency. Scientists argue that 7.0 or greater earthquakes have remained consistent over this stretch, despite an ever increasing number of smaller quakes. Regardless, the overall opinion is the earth is more active today than in the last 100 or so years.We know during the Tribulation earthquakes play a major role in God's judgement. 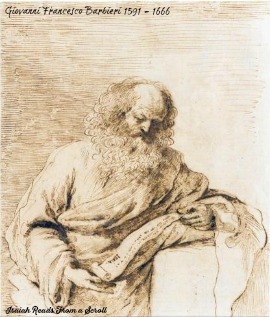 John, writing hundreds of years after Isaiah, saw similar pictures he recorded in multiple instances throughout the book of Revelation. "I looked when He broke the 6th Seal, and there was a great earthquake; and the sun became black as sack cloth made of hair, and the whole moon became like blood." "Then the angel took the censer and filled it with the fire of the altar, and threw it to the earth; and there followed peals of thunder and sounds and flashes of lightning and an earthquake." "And in that hour there was a great earthquake, and a tenth of the city fell; and 7,000 people were killed in the earthquake..."
"And the temple of God which is in heaven was opened...and there were flashes of lightning...and an earthquake and a great hailstorm." "And there were flashes of lightning and sounds and peals of thunder; and there was a great earthquake, such as there had not been since man came to be upon the earth, so great an earthquake was it, and so mighty." In Isaiah 24:1 God also says He will "scatter its inhabitants". 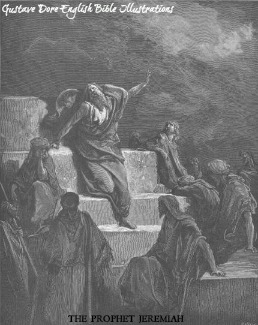 The Bible provides us with a precedent for this in Genesis 11:9, when God comes down to view the Tower of Babel project, and decides to confound the people's language, and then He "scattered them abroad over the face of the whole earth". Thus when God scatters His people, most of the time it is not a good thing. These two examples, and we can include the scattering of the Norther Kingdom's residents to make 3 examples, are results of sin and rejecting God and His commands. Everything becomes chaotic and unpredictable with the earth in these last days - the days leading up to John's Tribulation - and during the 7 year Great Tribulation. Isaiah even points out society becomes turned upside down in Isaiah 24:2. "And the people will be like the priest, the servant like his master, the maid like her mistress, the buyer like the seller, the lender like the borrower, the creditor like the debtor." The great prophet Jeremiah, writing approximately 150 years after Isaiah during the Babylonian Empire, offers insight into the state of affairs referred to in Isaiah 24:2. "The prophets prophesy falsely and the priests rule on their own authority; and My people love it so! But what will you do at the end of it?" During this period of time there is no religious or moral authority. We see the erosion of morality taking place before our very eyes every day. The attack on Christianity and traditional values is only increasing day-by-day. At the time of this writing, Jews in Ukraine are being forced to register as Jews by Putin, and ISIS has issued a fatal warning to the Christians of Nineveh Plain and Iraq to convert, pay a tax, or die. Hose the prophet spoke of this as well. "And it will be, like people, like priest; so I will punish them for their ways." The world's financial system becomes discombobulated, as the buyer becomes like the seller, "the lendor like the borrower, the creditor like the debtor". Perhaps it is this confusion which may give way to the one-world financial system which arises with the one-world government and religion of Revelation. This, of course, is speculative. What is not speculative is chaos reigns supreme as the earth groans under its weight. Isaiah 24:4-5 gives insight as to the cause of this massive and historic upheaval. 4 "The earth mourns and withers, the world fades and withers, the exalted of the people of the earth fade away. 5 The earth is also polluted by its inhabitants for they transgressed laws, violated statutes, broke the everlasting covenant." The "everlasting covenant" spoken of in Isaiah 24:5 was made by God to man in Genesis 9:13-16 after the flood. Much of the language used here reflects God's language to Noah. Simply put - the problem with the earth is mankind. The whole of mankind is guilty, just as it was in the days of Noah, and our guilt is the reason for God's anger and judgement upon the earth. The earth, man's world, is guilty by association; and because man lives upon the earth, the earth must suffer and undergo judgement as well. Man's sinfulness and his havoc upon the earth is confirmed in both the OT and NT. "So you shall not pollute the land in which you are; for blood pollutes the land and no expiation can be made for the land for the blood that is shed on it, except by the blood of him who shed it." It is quite remarkable to read these verses in Isaiah keeping in mind the days of Noah. Much of what God discusses with Isaiah, He had discussed with Noah eons earlier. Man's actions in the future days will reflect to a degree what life was like on earth before the flood. 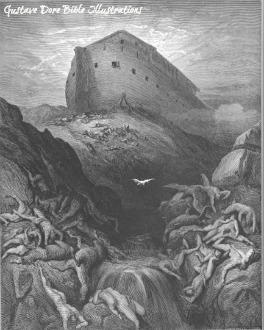 Genesis 6-11 deals with the days of Noah and how God dealt with a perverse and wicked earth. It is important to recognize the similarities in Isaiah and Genesis in a historical context. For these events - though thousands of years apart - show God's consistency and mercy when dealing with man. Man, too, is consistent. Listen to Jeremiah in Jeremiah 23:11. "For both prophet and priest are polluted; Even in My house I have found their wickedness,' declares the Lord." Jeremiah was over a hundred years after Isaiah. 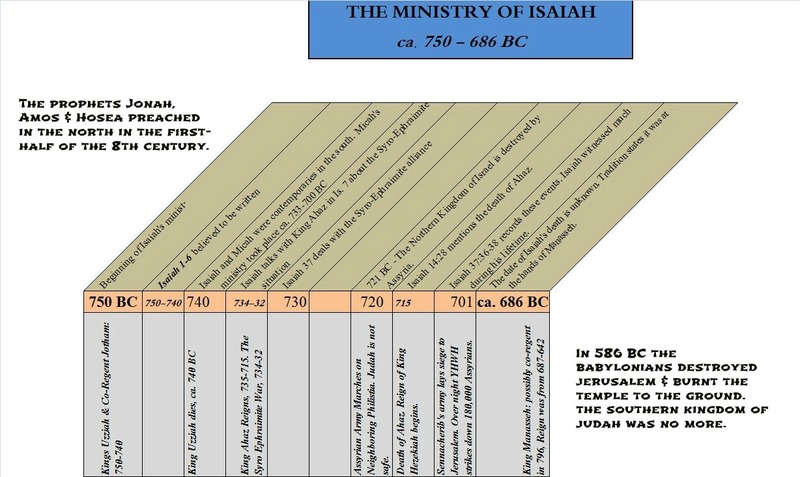 Isaiah was over a thousand years after Noah. Today, man is no different; and we are 2750 years removed from Isaiah. Isaiah also makes special mention of "the exalted of the people living upon the earth" in Isaiah 24:5. These are the rulers, kings, presidents, prime ministers, sheiks, congressman, princes, rich, famous and powerful living amongst us today. These are the exalted ones, and how they live it up during their day. Isaiah gives the precise reason for God's anger at both the earth and mankind in v. 5. "The earth is polluted by its inhabitants, for they transgressed laws, violated statutes, broke the everlasting covenant." The word, "by", is sometimes translated as "under" in other versions of Scripture. The meaning, however, is the same in both - man has polluted the earth by its actions and beyond repair. Under our yoke the earth has been perverted, polluted and maligned. This does not mean solely an environmental pollution, lest we lend credence to the global warming alarmists. Yet it does include such, along with the moral pollution and corruption of mankind. Things like unjust wars, genocides, holocausts, slavery, crimes against children, etc, etc, etc. "The main idea is that of straying away from the right path. Transgressing God's laws, violating His statutes, and breaking His covenant all contribute to 'pollution' of the land." Jeremiah speaks of such pollution in Jeremiah 3:1-2. Jeremiah compares Israel to "a harlot with many lovers". In v. 2 Jeremiah rails against Israel, saying they "have polluted a land with your harlotry and with your wickedness". We are guilty of similar acts today. The pollution of society continues, along with more and more actual pollution upon the earth. We know the exact time when this pollution began. It's recorded in Genesis 3:17. "Then to Adam He said, 'Behold you have listened to the voice of your wife, and have eaten from the tree about which I commanded you, saying, 'You shall not eat from it.' Cursed is the ground because of you; in toil you shall eat of it all the days of your life.'" So subtle is the phrase, "Cursed is the ground", that one often skims over it when reading this story. Isaiah 24 sheds light on the meaning of what God meant in Genesis 3. Herein lies one of the great mysteries of the Bible. Despite untold thousands of years of being written and compiled, by likely several authors and editors, it remains an intact, cohesive and corroborating story of God and His people from the Old Testament through the New. From Genesis 3 on the earth lived in a state of pollution. Shortly after Gen. 3:17 Cain spilled his brother's blood upon the earth, and blood hasn't stopped flowing since (Gen. 4:9-12). Blood requires blood, hence Israel's sacrificial system, and God gave Moses instructions on how to atone for sin/bloodshed in Numbers 35:33. And this, in a nutshell, is why the Great Tribulation must occur. Mankind is the guilty party, shedding oceans of blood upon the face of the earth since the dawn of time. Man, consequently, must pay for his actions. Though a remnant shall be spared to a degree, mankind as a whole must pay for the blood we've shed in violation of God's Law. In Deuteronomy 28:16 Moses revealed to Israel what God required of them. It is the same thing He requires of us - to obey and observe His commandments and statutes. Failure to do so results in negative consequences. "Therefore, a curse devours the earth, and those who live in it are held guilty. Therefore the inhabitants of the earth are burned, and few men are left." In Isaiah 24 :6 Isaiah fully reveals those consequences of not adhering to God. He leaves room for God's remnant, as "few men are left". But notice that those who live on earth are held guilty, thus the overwhelming majority of mankind left in this day will be burned. How, we aren't told, but the nature of warfare today is long-range ballistic missiles, tanks and nuclear weapons - all delivering deadly fire upon its unfortunate recipients. Earthquakes and volcanoes produce explosions and fire which rage upon the earth's surface. A meteor colliding with earth would produce massive fires around the point of impact, and globally.These fires would spread rapidly, and have lasting consequences for the entire earth and all of mankind. Joshua foresaw man's future iniquity in his farewell address to Israel - recorded in Joshua 23. He warns the people in vs. 15 and 16 if they disobey God, "then the anger of the Lord will burn against you, and you shall perish quickly forom off the good land wihch He has given you". Isaiah, too, gives warning in Isaiah 34:5-6. God's sword is "satiated in heaven, behold it shall descend for the judgement upon Edom." Zechariah also speaks of this curse in Zech. 5:34, which appears in his vision as a Flying Scroll covering all of the earth. From this point Isaiah speaks of what man's actions will be like in the great day of God's wrath. First, it must be pointed out the reoccurring theme in Isaiah of a small remnant being spared. As noted above, only a "few men are left". Isaiah speaks of this remnant in many verses throughout his book (Is. 4:2 / 10:20 / 37:31-32). 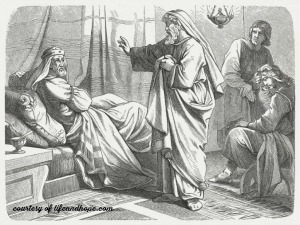 Joel (Joel 2:32) and Obadiah (Ob. 1:17) also spoke of this remnant. We don't know much about them, other than they reflect Christ's words in Matthew 7:14. "For the gate is small, and the way is narrow that leads to life, and few are those who find it." Isaiah 24:7-14 uses an agricultural metaphor in describing the actions of mankind. Israel was an agricultural based society. Their daily life and economy revolved around agricultural pursuits. For this reason many of the metaphors used in the Bible deal with agriculture. Jesus spoke most of His parables about agriculture. The people would've been easily able to relate to the point being made, because agriculture was their life and how they survived. 7 The new wine mourns, the vine decays, all the merry-hearted sigh. 8 The gaiety of tambourines ceases, the noise of revelers stops, the gaiety of the harp ceases. 9 They do not drink wine with song; strong drink is bitter to those who drink it. 10 The city of chaos is broken down; every house is shut up so that none may enter. 11 There is an outcry in the streets concerning the wine; all joy turns to gloom. The gaiety of the earth is banished. 12 Desolation is left in the city, and the gate is battered to ruins. 13 For thus it will be in the midst of the earth among the peoples, as the shaking of an olive tree, as the gleanings when the grape harvest is over. 14 They raise their voices, they shout for joy. They cry out from the west concerning the majesty of the Lord. Verse 7 implies lost joy. new wine was the result of fresh grapes and a healthy harvest. It was a time of joy and celebrations, a time to give thanks for provision. However, in this day "the vine decays". The prophet Joel uses similar imagery in Joel 1:11 when he says "the harvest of the field is destroyed". In Isaiah 16:10 God tells Isaiah that "gladness and joy are taken away from the fruitful field". In Isaiah 24:8 all celebration comes to a halt. The "tambourine ceases...the gaiety of the harp ceases". Earlier in Isaiah 5:12 we learned that mankind "does not pay attention to the deeds of the Lord" and continued throughout chapter 5 carrying on with their banquets and celebrations - much like in the days of Noah as Jesus revealed in Matthew 24:36-40 & Luke 17:26-27. Man becomes lost in his own world and loses focus of God. The celebration of the harvest was a natural and regular occurrence. They would've expected nothing but a joyous time to revel in their provisions and harvest. Suddenly, their "joy turns to gloom" (Isaiah 24:11). John, too, said as much in Revelation 18:22. "And the sound of harpists and musicians and flute-players and trumpets shall not be heard in you any longer..."
In v. 10 Isaiah reveals "the city of chaos is broken down". This is a crucial verse in understanding the timelessness of God and His consistency of character in dealing with mankind. The Hebrew word translated as chaos is TOHUW. It means; to lie waste, desolation, desert, a worthless thing, confusing, an empty place, without form, vain, vanity, waste. Interestingly enough this word has not other parallels in any known language. It is solely a Hebrew creation! Its a word found ONLY in the Hebrew OT Bible. Tohuw first appears in Genesis 1:2 when the earth is said to be "formless". Several scholars have translated this variously as; "without form and void", "a formless waste", "waste and void", "void and vacant", etc, etc. Zodhiates makes clear one thing about Tohuw - it has a very negative connotation. 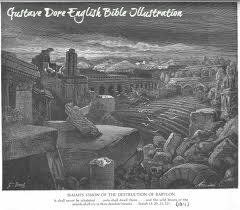 This "city of chaos" is metaphorically similar to the city of Babel in Genesis 11. God confounds Babel in Genesis 11:7. "Come, let Us go down and confuse their language that they may not understand one another's speech." 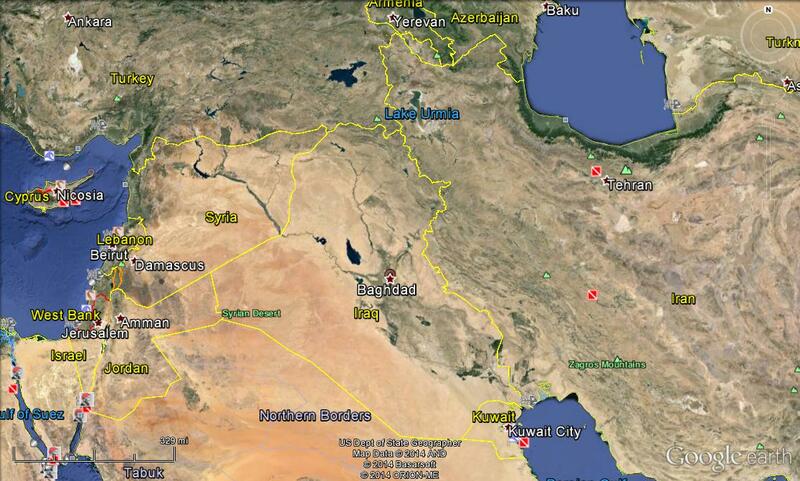 Bottom Left - Baghdad and Iraq as it stands today. The Babel of Genesis and Babylon of Revelation - though thousands and thousands of years apart - were indeed cities of chaos. 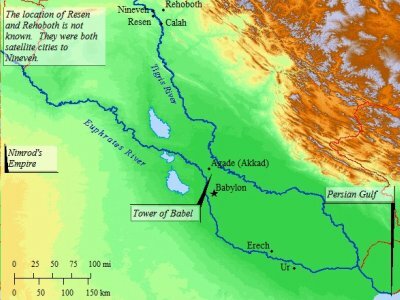 Babel and Babylon were built near modern day Baghdad, remarkably enough. Baghdad remains one of the most confused and violent cities in the world today. Baghdad, Iraq - mere miles from the ruins of ancient Babylon - seemingly stays in a constant state of political confusion and social upheaval. Isaiah continues with the harvest imagery in Isaiah 24:13. "For thus it will be in the midst of the earth among the peoples, as the shaking of an olive tree, as the gleenings when the grape harvest is over." Scholars debate whether Isaiah refers to the peoples of the earth, or more specifically, the Jews of his time that were in exile. Contextually it would seem Isaiah is referring to all of the people of the world. In Isaiah 11:11 he speaks of gathering the remnant from among all of the peoples of the world. Isaiah even invited Egypt and Assyria to be part of God's kingdom in Isaiah 19:18-25. Thus the second half of Isaiah 24:13 likely refers to a worldwide judgement of Jews & Gentiles alike, no matter their location. The agricultural imagery used in v. 13 has to do with the final harvest. When the olives and grapes are harvested they are gathered together off the vine. The healthy, fat and ripe fruit is picked, leaving only a little of the gleanings behind. Thus, what appeared to be a healthy and fruitful vine one moment, is stripped bare the next. Only a few of the olives or grapes are left on the vine, or laying on the ground. These are for the poor to gather. Micah uses similar imagery in Micah 7:1-2. "Woe is me! For I am like the fruit pickers and the grape gatherers. There is not a cluster of grapes to eat, or a first-ripe fig which I crave. The godly person has perished from the land and there is no upright person among men." The message by Isaiah, like Micah, is that God's judgement will consume mankind to the point where few men are left living. This is the harvest of mankind, the great day of God's wrath. Isaiah reiterates this in Isaiah 27:12. He is gathering up His faithful. In Isaiah 24:14 it appears some may believe, prematurely, that God's judgment is over. They raise their voices and rejoice. Both verses 14 & 15 seem to indicate the tide has turned. Such will not be the case, as will be seen. Yet, we know joy will one day reign over this earth. "Cry aloud and shout for joy, O inhabitants of Zion, for great in your midst is the Holy One of Israel." "Go forth from Babylon...Declare with the sound of joyful shouting..."
"Listen! Your watchmen lift up their voices, they shout joyfully togehter; fior they will see with their own eyes when the Lord restores Zion." In Isaiah 24:14 we learn people "cry out from the west concerning the majesty of the Lord. West has variously been translated as "sea". The LXX has a different rendering (compare to NASB v. 14 above). "Those shall cry aloud; and they that are left on the land shall rejoice together in the glory of the Lord; the water of the sea shall be troubled." The Jewish Study Bible interprets v. 14 to mean a specific group of believers, either Jewish or Gentile, begins to thank God in praise for His deliverance and judgement. Yet, suddenly they realize judgement is not over. The LXX states something altogether different. This translation indicates those "on the land" shall rejoice together, whereas, "the water of the sea shall be troubled". The "west" refers to sea, specifically the Mediterranean Sea, which is to the west of Israel. Sometimes the Bible uses the word "sea" metaphorically to represent the Gentile world (all people not Jewish). Isaiah uses "sea" in such a way in Isaiah 41:5 and 42:4, 10. In Revelation 13 the sea from which the Beast emerges has been interpreted to mean the Beast rises from among the Gentile nations. In this sense, "the water of the sea shall be troubled" when the Beast rises out of it. This means the Beast/Antichrist likely comes from the western sea, or, the Gentile nations to the west of Israel - perhaps more specifically, those Mediterranean Gentile nations. This interpretation of "west" and "sea" may, or may not, apply to Isaiah 24:14 depending on what version one studies. If one adheres to the King James Version, it does not. "They shall lift up their voice, they shall sing for the majesty of the Lord, they shall cry aloud from the sea." The question remains - Who is crying from the sea? A number of verses represent peoples from the sea, islands and coast lands. Keep in mind the LXX version which states outright what no other translation does - the water of the sea is troubled. Another clue is given in Isaiah 24:15, a continuation of verse 14. 15 "Therefore glorify the Lord in the east, the name of the Lord, the God of Israel, in the coastlands of the sea." Isaiah speaks of the coastlands in v. 15. Other versions read; "islands of the sea". Read the verses below for clues as to who the people of these islands and coastlands are. "Then it will happen on that day that the Lord will again recover the second time with His hand the remnant of His people who will remain, from Assyria, Egypt, Pathros, Cush, Elam, Shinar, Hamath, and from the islands of the sea." "Sing to the Lord a new song, sing His praise from the end of the earth. You who go down to the sea, and all that is in it. You islands and those who dwell on them." "Listen to Me, O islands, and pay attention, you peoples from afar..."
"My righteousness is near...The coastlands will wait for Me, and for My arm they will wait expectantly." "Surely the coastlands will waif for Me, and the ships of Tarshish will come first, to bring your sons from afar." "And I will set a sign among them...to the distant coastlands that have neither heard My fame nor seen My glory..."
We can gather one definitive aspect of the "coastlands of the sea" and those who dwell on them. They are from remote and distant places in relation to Israel. In 49:1 Isaiah calls them "peoples from afar", and repeats this in 60:9. They are also identified with the ships of Tarshish, a mysterious and enigmatic appellation which appears periodically throughout the Old Testament. We discussed the ships of Tarshish in Isaiah 23. Thus, these people are crying out in Isaiah 24:14. The LXX states it is because "the water of the sea shall be troubled." Scripture gives us two groups of people in this part of Isaiah 24. We have those in the east, or as some versions read, "the region of light" - being Israel and the surrounding nations. We also have those peoples from afar, from the islands and coastlands of the sea. In this respect Isaiah covers all of mankind, starting with those living in the east ("glorify the Lord in the east") and progressing to those living in the far-flung regions of the west ("in the coastlands of the sea"). The name of YHWH will be proclaimed by all who see the sun. It is interesting to take note of Isaiah 11:11. This verse states God will, for a second time, rescue "a remnant of His people" from "the islands of the sea", as well as from other places and countries. In other words, God pays careful and close attention to all of His creation, even the far-flung, remote corners of the world. Read the following. "Listen to Me, O islands, and pay attention you peoples from afar..."
Whoever these people are, and wherever their remote islands may be, Isaiah assures them no matter how isoloated they may be, God is ever present with them - from east to west and north to south. God hearkens to all of His creation. In fact, in Isaiah 24:16 we hear "the ends of the earth" singing to God. "From the ends of the earth we hear songs, 'Glory to the Righteous One.' But I say, 'Woe to me! Woe to me! Alas for me! The treacherous deal treacherously, and the treacherous deal very treacherously.' "
Though not every man will praise God, He will be known in every land, and in v. 16 people from "the ends of the earth" sing praise to God. The chronology of the text suggests these people may have perceived God's wrath on the earth as being over. Perhaps there is a period of peace and quiet upon the earth in that day which lead many to decide God's Judgement is past, or the hardship is over - thus they begin to rejoice. However, Isaiah warns them this is not the case. 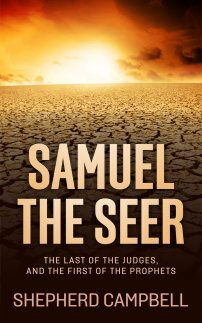 It is clear God's judgements are not over, as Isaiah screams; "Woe to me! Woe to me!" The celebration is premature. The ordeal is not over until God establishes His kingdom on earth, and we know in v. 16 this has not happened yet. In vs. 17-20 we see the real severity of God's wrath. The language and wording in v. 16 is significant, as Isaiah used similar language once before in Isaiah 21:2. This verse deals with Babylon's fall. "...The treacherous one still deals treacherously and the destroyer still destroys..."
It is interesting to take not of the Greek Septuagint (LXX). The LXX does not have the second half of v. 16 - Isaiah's response - starting at "Woe is me!". Thus Isaiah 24:16 remains somewhat of a mystery verse, as scholars have debated its original form and intent. Most simply skim over v. 16 despite the importance of the verse to the overall meaning of Isaiah 24. Isaiah repeats the word "treacherous" 4 times in this one verse, thus creating a powerful wordplay meant to emphasize the word and Isaiah's point. The Hebrew for "treacherous" is BAGAD. It means: to cover, to pillage, to act covertly, deal deceitfully or unfaithfully, transgress, fraudulent, betray, to oppress. The root of the word means "to cover" - thus many of these translations are figurative, defined by the root and context in which it is used. In English we have a similar saying - "cloak and dagger". When one is engaged in a cloak and dagger activity, it is said to be in secret, something done in secret. Bagad appears 47 times in the OT in the context of marriage (Ex. 2:18), Israel's unfaithfulness (Jer. 9:2), and in regards to human relationships (Jdg. 9:23; Job 6:15). Jeremiah used the word frequently in his writings.
" 'Surely, as a woman treacherously departs from her lover, so you have dealt treacherously with Me, O house of Israel,' declares the Lord." Job used this root as Isaiah did - to represent and symbolize human interactions. The repetition of treacherous four times by Isaiah in 10 words emphasizes the wickedness and evil persisting at this time. Evil will not only be pervasive in society, but will multiply and increase in the great day of God's wrath. With the addition of "very treacherously" to v. 16 Isaiah stresses that in the day of God's wrath man will increase his evil, his fraud, his deception, his betrayal, his acts of aggression and oppression upon his fellow man. The evil will become more evil, and the wicked will increase his wickedness. Man's regard for each other will wane in these last days, and those that deal fraudulently will benefit even more. Ungodliness will be lifted up as the standard for normal behavior. We're already seeing this in action today. Society is redefining itself and what it deems acceptable. Values are changing and moving away from Godly standards based on the name of "human rights". The phrase itself proclaims man above God. Christianity today is under attack on a global scale, though this is hard for Western countries to fully grasp. Hedonism is on the rise globally. Radical Islamists kidnap girls in the name of Allah, then execute them if they do not convert. In the U.S. we have redefined marriage, after 5000 years of it meaning a man and a woman. The church now seeks to redefine who it should and should not marry within the church - as if there is really a debate. To stand for God's definition is to be a bigot, according to mainstream thinking. Children are aborted faster than they are born in many cases. Satanists contend anything Christian at every turn, and are given credence to their calls. We are rapidly slipping into the state of the earth as it is during the Great Day of God's Wrath. The treacherous deal treacherously. They are wolves dressed as sheep. Our current state of affairs will only progress until this earth is in the state Isaiah prophecied about in Isaiah 24 - nearly 1800 years ago. Verses 17-18 in Isaiah 24 indicate there is NO ESCAPE for those on earth during this frightfully magnificent time. 17 "Terror and pit and snare confront you, O inhabitant of the earth. 18 Then it will be that he who flees the report of disaster will fall into the pit, and he who climbs out of the pit will be caught in the snare; for the windows above are opened, and the foundations of the earth shake." Isaiah 24 :18 indicates there will be no escape from God's wrath, despite man's best efforts. Man will flee one disaster, to be met by another disaster. These events - the terror, pit & snare - will fall upon the earth suddenly and deliberately. The prophet Amos spoke of man's inability to flee what awaits in Amos 5:19. "As when a man flees from a lion, and a bear meets him, or goes home, leans his hand against the wall, and a snake bites him." Amos was a shepherd from rural Judah. He prophecied ca. 750 BC during the reign of Jeroboam II. Amos' ministry lasted only a few days, but his words have lasted for nearly 3000 years! Amos, like Isaiah, preached man will attempt to flee God's Day, yet their efforts will be futile. Isaiah progresses by giving examples of how the earth will be affected by mankind's gross corruption. Isaiah 24 :18b-20 graphically portrays the earth's physical state. These verses read more alike a sports writer's description of a battered boxer, knocked out and unconscious, beaten down and bloodied by a far superior adversary. Verse 18 marks a clear transition by Isaiah from a description of man's actions upon the earth - to the punishment dished out upon the earth. "...For the windows above are opened, and the foundations of the earth shake..."
Isaiah uses language eerily similar to that used in describing the state of affairs in Noah's day, as recorded in Genesis 7:11. "In the 600th year of Noah's life, in the 2nd month, on the 17th day of the month, on the same day all the fountains of the great deep burst open, and the floodgates of the sky were opened." Fascinating! Isaiah uses imagery from Noah's time to get across his message of a global disaster. God has promised a flood will never again destroy the earth - though massive floods have occurred periodically throughout history - yet He also states that in the Great Day of His Wrath the earth as it is will be destroyed again. We previously discussed in great detail the earthquakes recorded in Revelation (5 of them), and the recent uptick in recorded quakes worldwide. This intense global seismic activity is sure to trigger volcanoes and tsunamis of biblical proportions - creating an earth more hostile to man since the end of the last Ice Age. The last part of Isaiah 24 :20 is chilling. "...For its transgression is heavy upon it, and it wall fall, never to rise again." The "it" discussed is the earth. Isaiah has recorded the last days of our Earth's existence! What a chilling thought for those alive during this future period. The NT also corroborates what Isaiah says here in chapter 24. When taken into context with Isaiah 24, II Peter 3:10 & II Thessalonians 5:2-3 marvelously expound on Isaiah 24, written some 700 plus years before Peter and Paul. "But the day of the Lord will come like a thief in the night, in which the heavens will pass away with a roar and the elements will be destroyed with intense heat, and the earth and its works will be burned up." What are products of earthquakes and volcanoes? Fire, lava and intense heat. All one has to do is research the dramatic eruption at ancient Pompeii to see the massive destruction caused by volcanoes. Now, man can create "intense heat" through the production and distribution of nuclear weapons - which an eliminate entire cities and regions. Now read II Thessalonians 5:2-3. "For you yourselves know full well that the day of the Lord will come just like a thief in the night. While they are saying, 'Peace and safety!' then destruction will come upon them suddenly, like birth pangs upon a woman with child; and they shall not escape." Just like the residents of Pompeii, Nagasaki and Hiroshima will be those living upon the earth in the last days. They will be living their daily lives - and then destruction will come suddenly and without reprise. There will be no escape for those of us on earth. Fire will consume and destroy, and the earth "will fall never to rise again". Mankind will be burned up along with everything else living on earth. Yet man is not alone in his punishment. Isaiah 24 :21 present a fascinating picture of God's thorough judgement upon His creation. "So it will happen in that day that the Lord will punish the host of heaven on high, and the the kings of the earth, on earth." "In that day the Lord will punish the powers in the heavens above and the kings on the earth below." It's clear this verse speaks of God punishing some of His angels during this time, along with the wicked kings of the earth below. Many times in Scripture we read of God being the Lord of the hosts, or, the Lord of the host of Heaven. A fascinating verse is found in Job 1:6. What we have here in Job is a gathering of the Heavenly host before their King. The host of heaven were sons of God, or angels - of whom Satan was one of them. Listen to the Lord in Isaiah 45:12 & Psalms 148:2. "It is I who made the earth, and created man upon it. I stretched out the heavens with My hands, and I ordained all their host." "Praise Him, all His angels; Praise Him! All His hosts!" In this verse God speaks of the host as His angels in heaven and the stars in the sky. Symbolically we often read of angels being compared to stars in the heavens. Lucifer can transform into an angel of light (II Corinthians 11:14). Job 38:7 (below) also sheds light on Isaiah 24:21. "When the morning stars sang together, and all the sons of God shouted for joy." So if "the host of heaven" are God's angels, which scripture shows they indeed are, then which ones is He punishing and why? Revelation 12:9 speaks of Satan's original rebellion in Heaven, the result of which was he "and his angels were thrown down" to earth from the heavenly realm. Certainly this is the host Isaiah speaks of, however, there is likely another set of angels primed for this punishment as well. These angels are identified in the NT book of Jude. Jude addresses them in Jude 6. "And angels who did not keep their own domain, but abandoned their proper abode, He has kept in eternal bonds under darkness for the judgement of the great day." What in the world is Jude talking about? What is meant by "angels who did not keep their proper abode"? What does it mean when angels do not keep "their own domain"? We know of Satan's rebellion, but if Jude was referring to this event why would he not refer specifically to it, like in Revelation 12:9 & 20:1-3 when Satan is mentioned by name? Is there another instance in the Bible of angels leaving their proper abode, which was in heaven? In fact, there is - and it occurs in Genesis 6:1-2,4. 1 "Now it came about when men began to multiply on the face of the earth, and daughters were born to them, 2 that the sons of God saw that the daughters of men were beautiful; and they took wives for themselves, whomever they chose...4 The Nephilim were on the earth in those days, and also afterward, when the sons of God came in to the daughters of men, and they bore children to them. Those were the mighty men who were of old, the men of renown." Immediately following this narrative in Genesis 6 is the Flood, recorded in Genesis 7. The natural question arises: What happened to these angels and Nephilim? 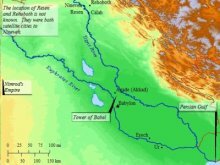 We know they did not perish completely with the Flood, for Genesis 6:4 adds the phrase, "and also afterward", thus indicating they, or at least some of them, survived the Flood. This is confirmed by a passage found in Numbers 13:33. This passage occurs during the Exodus under Moses. This was a very long time after the episode in Genesis 6. How long is impossible to tell, but at least thousands of years had passed from Noah to Moses. 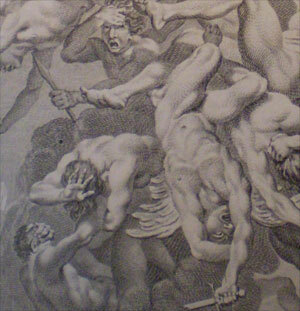 These fallen angels were still around during the time of Moses. Are they still around today? The answer according to these passages in Isaiah 24 and Jude seem to indicate yes. Jude 6 says God has kept them "in eternal bonds under darkness". 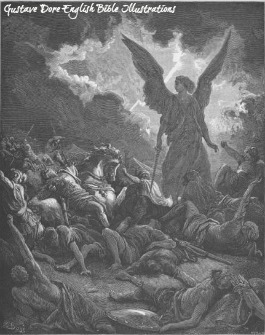 The natural assumption (and it is only an assumption) is that God has kept some, if not all, of these Nephilim from Genesis 6, as well as possibly other angels from the original rebellion and other angelic transgressions, in the abyss specifically for "the judgement of the great day". God's confining them to the abyss, or under eternal darkness, is confirmed by a number of other biblical passages as well. II Peter 2:4 - "For God did not spare angels when they sinned, but cast them into hell and committed them to pits of darkness, reserved for judgement..."
Luke 8:31 - "They were imploring Him not to command them to go away into the abyss..."
Revelation 9:2,11 - "He opened the bottomless pit, and smoke went up out of the pit, like the smoke of a great furnace; and the sun and the air were darkened by the smoke of the pit...They have as king over them the angel of the abyss; his name in Hebrew is Abaddon, and in the Greek he has the name Apollyon." Revelation 11:7 - "When they have finished their testimony, the beast that comes up out of the abyss will make war with them, and overcome them and kill them." Revelation 17:8 - "The beast that you saw was, and is not, and is about to come up out of the abyss and go to destruction..."
Revelation 20:1-3 - "Then I saw an angel coming down from heaven, holding the key of the abyss and a great chain in his hand. And he bound him for a thousand years; and he threw him into the abyss..."
There can be little doubt from these passages that God punishes mankind and the angelic realm for transgressions against Him. The Bible records two instances of angelic rebellion - though Genesis 6 is a very controversial passage, and this interpretation is certainly outside the box of orthodox thought (though with good reason). Yet the Bible clearly indicates angels have rebelled against God in the past. Isaiah addresses these angels in Isaiah 24 as part of the Heavenly judgement upon mankind and the earth. His words are backed by other prophets and passages, some spoken of thousands of years before Isaiah, other passages 700 - 800 years after Isaiah. Remarkably all of these passages corroborate each other. At the time of God's Great Day, the earth, man, and angels will ALL enter into judgement before Yahweh. Isaiah ends his vision with the fallen angels and evil kings of the earth bound in prison and awaiting punishment. Perhaps Revelation 9:2,11 is a vision of this very prison. Isaiah speaks of the abyss being opened and the prisoners released during the Great Day of God's Wrath. Isaiah also emphasizes they will be punished, and perhaps the picture in Revelation 20:1-3 is the final fulfillment of this punishment Isaiah speaks of. Regardless if such is the case, Isaiah's vision ends in Isaiah 24:23 just like every other vision in the Bible regarding God's Wrath & Tribulation. "For the Lord of hosts will reign on Mt. Zion and in Jerusalem." In other words - God wins.